-- I Olympic Winter Games, Chamonix 1924. 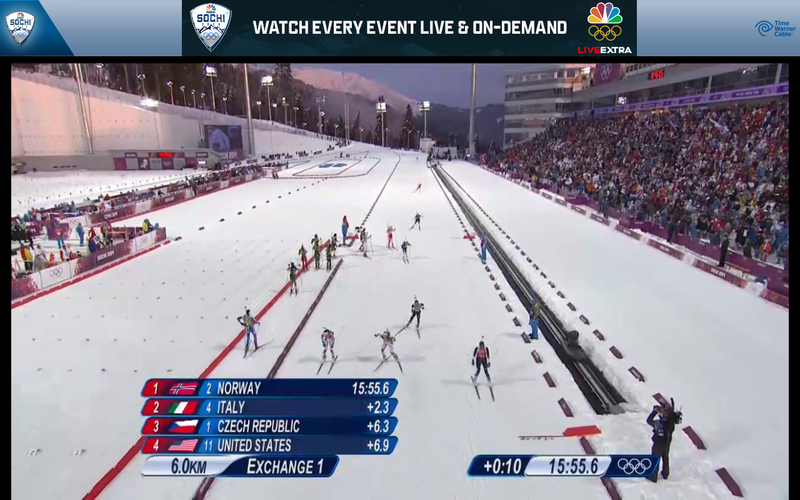 The NBC afternoon program, meanwhile, showed the close of the men's team sprint classic cross-country skiing race. Al Trautwig does the play-by-play for these things, and he is joined for color commentary by Chad Salmela, a former member of the U.S. biathlon team who now coaches the sport in Minnesota. Salmela gets so excited that he can be pretty tough to understand when there's a good, close race; luckily, Trautwig has been around the block and knows how to keep a viewer informed of what is going on. Anyway, today's race was definitely good and close. Outside the stadium where the race would end, three racers had separated from the pack: Germany's Tim Tscharnke, Finland's Sami Jauhojaervi and Russia's Nikita Kriukov. Salmela noted that Kriukov was far and away the best sprinter remaining and, therefore, could afford to let the race stay close into the stadium for the final 100 meters or so. Tschamke seemed to hear Salmela and surged to the front, huffing and puffing himself to as large a lead as he could muster entering the stadium. Jauhojaervi responded in kind, and Salmela wondered if Tschamke had the energy to keep charging through the finish. So the racers get into the stadium, and the German does seem to be losing steam. On a banked curve in, the Finn cut from inside position and in front of the German. The back of his ski clip the front of Tschamke, and down in a heap he went--ultimately spilling somewhat into the skis of the Russian, who was now making his move. Jauhojaervi sprinted to the finish for gold; Kriukov gathered his balance to hold second, and I'm not sure exactly what happened to Tschamke. He had a significant lead on the rest of the field. But he apparently stayed on the ground for a while, and then he apparently didn't immediately ski toward the finish line even after he did get up. Salmela commented that it appeared to him that the German could've still claimed bronze. Instead, the medals went gold to Finland, silver to Russia and bronze to Sweden. The Germans protested, but the International Ski Federation at least initially was unmoved. Per NBC, there then ensued a 48-hour window in which the Germans could pursue an appeal, so we'll see. Actually, the ones who have the most to benefit would be the Russians, who would be awarded the gold if Finland was disqualified. Simi Hamilton, a 26-year-old from Aspen, Colo., and Erik Bjornsen, a 22-year-old from Winthrop, Wash., teamed for the United States to finish sixth in the race. Norway, Finland and Sweden took the gold, silver and bronze medals, respectively, in the women's team sprint classic cross-country skiing race. Team USA finished eighth. In women's 5,000-meter speed skating, the big news that the Dutch did not win gold. That medal went to Martina Sablikova of the Czech Republic. Silver and bronze did go to the Netherlands. Top American finished 16th. Oh, and it didn't work out for Team USA in the mixed-relay biathlon, either. After Dunklee's strong start, the other three Americans missed a bunch of shots, which led to a bunch of delays. Team USA finished ninth. Gold went to Norway; silver, to the Czech Republic, and bronze, to Italy. So, hopefully, that's all the bad news for Team USA today. The prime-time show promises coverage of men's giant slalom alpine skiing, women's bobsled and men's parallel giant slalom snowboarding. Those events and women's parallel giant slalom snowboarding all are awarded medals today. Maybe Bob Costas is going to have a bunch of good news for us this evening. Meanwhile, in the women's curling semifinals today, Canada (against Great Britain) and Switzerland (against Sweden) both had last-rock shots with opportunities to advance if they could draw to the button. Canada succeeded; Switzerland did not. Great Britain and Switzerland play for bronze, and Canada and Sweden play for gold Thursday. Wednesday-night church is a pretty common thing where I live, in Madisonville, Ky., but many Christian Church (Disciples of Christ) congregations do not have a Wednesday-night service. I don't know exactly why this is, but neither of the two Disciples congregations of which I've been a member had a regular Wednesday-night worship, Bible study, fellowship event, etc. And it seems most of those congregations within the denomination that I'm familiar with don't typically get together on Wednesday nights. And so, with our local congregation's super-generous support and prayer, we've started a new thing. Rach feels called to plan meal worship services, and I feel called to invite folks (or invite them back) into a community of faith in Christ who, for whatever their reasons are, aren’t moved to attend a traditional Sunday-morning service. It's still kind of loose; the constants are a potluck meal, potluck conversation around some passage from the Bible and communion. The working title is "potluck church," and we've gathered 13 times since getting rolling in the fall. That's great, Eric. I wish you all the best. It has turned out that Wednesday nights at First Christian here in Madisonville have been our typical rhythm at worship. This is not what we intended. We both felt like we should get away from a traditional church campus (because there are some individuals who are just totally turned off by traditional church campuses) and Wednesday nights (because so many churches in town already do a Wednesday-night thing, and we wanted to create a scenario where someone might feel moved through these potluck things to start also going or going back to a traditional church). But for the first dozen folks or so who have started coming, Wednesday nights at First Christian have turned out most frequently to be the best option, and so here we are. And there we were last night. That's not much for a lot of worshipping communities, but it's a heck of a lot for ours. But, whatever, we got into Matthew 5, and there we were until almost 10. There's a lot to Matthew 5. Word to that. It doesn't get any better--doesn't get any more welcoming, doesn't get any more exacting--than Matthew 5. On the way home, though, I started thinking about the Olympics. I'd missed everything, and I didn't just want to check results. But I also was too sleepy to stay up watching video streams on NBCOlympics.com. I came home and fired up the VCR--yes, the VCR--to tape NBC's morning-wee-hours replay of its previous night's prime-time show, and then I'd get up early and watch it today. Except, in turning on Channel 6 to go through the process of setting the VCR timing, I caught the tail end of the prime-time show, which has been running over to 10:30. And there was Bob Costas at the fireplace with Ted Ligety, showing us the new medals table. Gold, silver and bronze today for Team USA, Bob told me. Frankly, I was disappointed--and not just for the aggregate spoiler. By my count, I didn't know the results of four medal events--men's giant slalom alpine skiing, women's bobsled and men's and women's parallel giant slalom snowboarding. When I went quiet on women's bobsledding the other day (in respect of the live-blogging jinx), Teams USA 1 and 2 stood first and third. I had set my expectations at five medals for the Americans in the Wednesday-night prime-time show--and maybe two golds? This morning, I dug into the videotape, and the first event they showed on the prime-time show was the alpine skiing. Ligety, the Torino 2006 gold medalist and 2011 and '13 world champion in the giant slalom, was a significant favorite for gold, NBC told us before the race. And after the first of two runs in Sochi yesterday, Ligety had a significant lead--only one competitor, Ondrej Bank of the Czech Republic, was within a second of his first-run time. NBC gave us a little interview with a confident Ligety--I would've not broadcast this exchange in respect of the live-blogging jinx--and then they cut away to show a bunch of girls' and women's figure skating. Bode Miller had finished 26th in the first run. "Not a lot expected out of Bode in this giant slalom," one of the NBC commentators said as Miller came down the hill on his Run 2. He ended up 20th. Still, the NBC reporter who made Bode cry the other night after his bronze win came back to do another interview with him after this race, and he seemed fine--it was his daughter's sixth birthday, so he got to pass along his greetings to his little girl, Neesyn, back home in the United States. Happy belated birthday, Bode Miller's 6-year-old daughter! After Miller's run, the NBC narrative--do they show in tape delay live commentary against the live race, or do they talk against the film already knowing how everything's going to come out?--became all about how heavily "rutted" the "soft snow" was becoming. This, they said, was creating an increasing disadvantage for the later skiers. For Run 2, they race in reverse order of the Run 1 finish, so Ligety would be racing dead last. France's Steve Missillier, who finished 10th in Run 1, moved to first place, and the next eight racers labored down the hill. Bank, who had been second, would end up finishing fifth overall. An Italian who had come in third after the first run slid all the way back to 17th by the end of the race. Skiers who had tied for fourth after Run 1 ended up sixth and ninth at the end of Run 2. I was officially worried for Ligety--even after seeing him around the fireplace with Bob last night. He left the starting gate with a margin for error of 1.5 seconds (the difference between his and Missillier's Run 1 times). At each split, NBC showed that Ligety's lead was melting with the snow … 1.46 seconds … 1.19 seconds … 0.87 seconds … Through the ruts and toward the finish line came Ligety, and here's the silver medal among Team USA's gold, silver and bronze today, thought I. But no! Ligety had salvaged less than a half second of his start-of-Run-2 advantage, and the favorite for men's giant slalom gold had come through. Great! Congratulations, Ted Ligety, 29-year-old from Salt Lake City! Except what the heck happened to the women's bobsledders? No, really, what happened? I fast-forwarded through the rest of the show, and all they had was more figure skating. I like all of these sliding events. "I don't know what happened with this start," says the NBC commentator. "Four hundredths of a second slower than their previous starts. Four hundredths at the top is 12 hundredths at the bottom, so, basically, they lost it at the top." Women's parallel giant slalom snowboard: Switzerland gold, Japan silver, Russia bronze. Men's parallel giant slalom snowboard: Russia gold, Switzerland silver, Slovenia bronze. Top American in the men's race finished 24th. Team USA didn't even have a competitor in the women's final.